These new photos shown yesterday, today and tomorrow are from Wednesday's unsuccessful search for insect repellent. When posting repeated photos, we always mention that they're repeats. It isn't often we are able to take a photo of a horse and buggy when the many of the owners request money for photos. We never pay for photos, other than for entrance into specific sightseeing venues. Nurturing. It's what we do for those we love. If they'll accept it. When they're sick or upset. Lost or unsure. We attempt it. If they refuse, we try again, hoping the end result will be different after the same behavior. Which isn't usually how life works. In the case of nurturing, a persistent caregiver will eventually win as will the recipient of the care who eventually sighs in grateful resignation allowing us to offer that loving helping hand. And suddenly, we get to work in an almost enthusiastic frenzy to be of assistance, dashing to and fro in endless tasks to reap the fruits of our good intentions: That the recipient is feeling better. The Big Square was less busy with tourists than usual. Without question, I am a nurturer. Can't help it. As many of you read this, you see yourself. It's sad when a loved one is ill. We're anxious to help them get better. The secret to being a good nurturer is not to hover. After the imminent tasks are completed it is imperative to sit back quietly busying oneself in other tasks evident to the recipient. Thus, the recipient becomes open to asking for more assistance as needed or as gently offered on obvious occasions. It was odd to see less activities and vendors in the Big Square. This is Tom and I when he is sick. More worried about my well being than his own. I'm not sick. Yet, anyway. How many days does it take for the nurturer to catch the illness? Not sure. I tried to look it up online but the answers were vague. Tom must be quite ill in order to allow me to nurture. He has his own nurturing tendencies but often lacks the skills to exercise them with ease, not unusual in the male populations. A hotel in the Big Square. Yesterday, the challenge was clear. His frequent rounds of snorting, wheezing coughing as well as persistent sniffing pushed my irritation buttons. At times, I thought, 'If that was me, I'd go hide away in the bedroom rather than subject him to such obvious suffering." But then again, I'm kind of shy about gross bodily sounds. Rather than comment about the constant noises, gently I provided fluids, aspirin, antihistamines and tender loving care, remaining across the room of course, at his beacon call. Careful to avoid touching him or his stuff, he held out his open mug for me to pour in the beverages and ice. I dropped the pills into his open hand. Again, I slept alone, finally getting a good night's sleep with no new no-see-um bites. A miracle, indeed. Vendors of discounted clothing often place their stock on a blanket on the ground, hoping takers will stop by for further negotiations. However, nurturing wasn't reserved exclusively for me. Midday, Madame Zahra, after a little concerned hovering of her own, grabbed a fluffy down comforter, a sheet and pillows and made up a bed for him on the sofa in the far end of the salon. He was far enough from me to avoid the spray of his fits of coughing and sneezing, close enough to know when I was needed. When Madame and Oumaima arrived in the morning the language barrier presented an issue when I tried to describe that Tom was sick and slept in the yellow room. With flying hand signals coupled with my choppy French, I was able to explain that they shouldn't clean the yellow room for several days to avoid getting sick themselves. Somehow they understood appreciating my efforts to explain. We appreciate them. More than we can say. Tee shirts and women's tops hanging in a shop in a souk. Madame made us a perfect dinner, as always. We chose to eat at 5:30 instead of 6:30. We both needed to eat, after 24 hours without a morsel, not an uncommon occurrence without access to cooking our own meals. Oh, I know protests are rampant at this mention about not eating more often. We only eat when we're hungry. Period. It's called, "Intermittent Fasting" which we've been doing since the beginning of our travels, except when cruising when we eat breakfast and dinner. Eating this way is not appropriate for everyone. It works for us. Stickers and signs for sale. Email me if you'd like the names of reputable books quoting numerous studies of the benefits of eating less often, eating only when the body signals. If we're hungry, we eat more often. The cavewoman/caveman didn't have a fully stocked refrigerator of goodies. The human race was perpetuated. See, it all worked out. In any case, Tom appears to be feeling a little better today. He changed his shirt. He's sitting up listening to his radio show from Minnesota, Garage Logic. Perhaps, in one more day we'll be able to go out again. I'm getting "riad" fever. A year ago today, we spent the day in Barcelona. 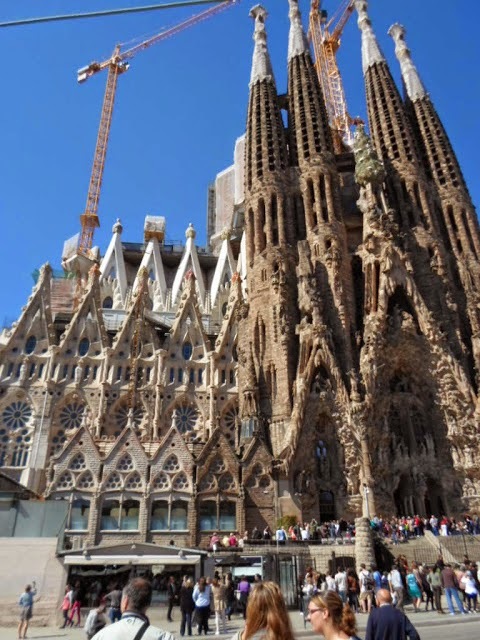 Our first sight to see was the Sagrada Familia, the church that remains unfinished although the construction continues after over 100 years for which Antonio Gaudi is credited. Labels: About Us, Barcelona Spain, Marrakesh Morocco, Medical Issues, Our Story, riad, Sagrada Familia, Tom, vacation homes, world travel.